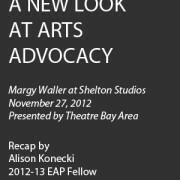 In a presentation hosted by Theatre Bay Area at Shelton Studios on November 27, Margy Waller, senior fellow at the Topos Partnership, presented the findings from a research initiative designed to better understand what arguments for artistic value did and did not resonate with the general community. The arts contribute such-and-such dollars to the GDP! For members of a sector with largely qualitative attributes, individuals in the arts have gone to great lengths to provide quantitative data in support of their cause. It’s certainly understandable – we figure we’re being smart tacticians by engaging in the numbers and stats which are so significant to other sectors. Go on, tell us we’re frivolous and a waste of tax dollars . . . then bam! Hit them with the good stuff. “Perhaps you didn’t know, but for each new dollar of ‘value added’ by the performing arts industry in California, the state’s economy gains $1.38.” You smile triumphantly, holding back that well-deserved pat on the back. According to Waller, you’ve already lost the battle. Their eyes have glazed over and they’re thinking about whether it’s their turn to bring in the office donuts tomorrow. But why? you ask. I spoke their language! As explained by Waller, the use of economic impact facts and figures by well-meaning arts advocates is a misguided approach. The same goes for the other favorite tool in the bag of arts advocacy tricks – arts education. Facts and figures are boring, and often do little to dispel any skepticism on the part of the listener. Arts education, while successful in inciting far more excitement in the listener, is often a tricky route to navigate. The excitement lies in the education component, leaving the arts part of the matter lying sad and forgotten in the dust. It’s these typical non-responses or misguided responses to arts advocacy efforts that led Waller, with the Topos Partnership, to develop a research initiative aimed at determining which arguments for artistic value resonated with the general community, which did not, and which were even proving detrimental to the cause. Through hundreds of talkback sessions designed to uncover what people think about a topic, rather than what they know about it, Waller found some surprising results – most notable being that “the arts” were often equated to entertainment. That in itself wasn’t terribly surprising. More surprising was the equation between the two. When viewing the arts as entertainment (a private choice), many failed to see why they were deserving of public concern and funding. If that is, indeed, the prevailing sentiment, is there even a place for arts advocacy? The kicker was that even if individuals were not attending or actively participating in arts-related activities, they still believed in these two benefits. The key, then, as Waller discovered, was to draw upon these positive associations already residing within the hearts and minds of individuals and use them to the arts advocate’s advantage. Rather than fighting to overcome hurdles already laid out clear and menacing, why not take the path of least resistance by working with the positives and build from there? A notion revolutionary in that it’s not revolutionary at all. Put down the stats sheet? Drop the picture of children huddled over an arts and crafts table? – Yes! Well, sort of. Pictures of children eagerly tucking into arts projects are great, as long as the pictures are within the larger frame of the arts contributing to the connecting of those children, not solely within the long-favored framework of arts education. The discussions framing the arts need to be shifted from the personal to the public arena. The way to achieve that shift is through the notion that creative activity sets off a ripple effect of significant benefits throughout the community, contributing to its overall vibrancy and connectedness. In addition to shifting this framework within one’s own public relations and advocacy efforts – be it for a single organization, a local arts community, or the arts nationwide – a crucial factor in making this approach work is ensuring that your message is conveyed clearly across all channels. Often, those channels are trickling down from our friend/foe, the press. Sure, you can’t control the press 100% of the time (ha!) but you can work with the press on a regular basis to provide them with the framework in which you’ve already carefully laid out your pro-arts messages. When they contact you looking for an image to run with their coverage of your event, don’t send them the static picture of a playbill or the symphony hall that does little to demonstrate to the community the positive impact of your arts organization. Instead, send them the pictures of the audience mingling before the performance, or the artist chatting with a gallery patron at an opening. Yes, you read right – no need to even show images of the orchestra/artwork/ballet; what is important is conveying how those things contribute to the vibrancy and connectedness of a community. Of course, it isn’t merely a matter of being PR savvy. If you want your community to start thinking collectively with regard to the arts, then you have to start thinking collectively as well. Get creative! 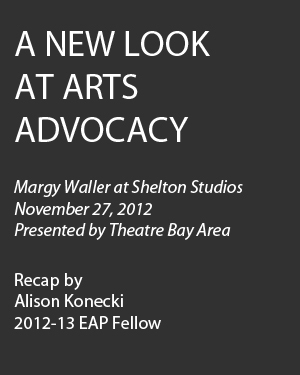 For more inspiration, and in-depth report on Waller’s findings, check out The Arts Ripple Effect. If it’s always a fight down to the eleventh hour to get the support and funding, why not focus your efforts on shifting the community’s day-to-day mindset about the arts so that it never has to come down to the eleventh hour? Forget the stats and work with the values already in place: the arts contribute to the overall vibrancy and connectedness of a community; investment in the arts is an investment in our community. What are some of the ways you have worked to advocate for the arts within your community? What worked? What didn’t? Are you surprised by Waller’s findings? Will you adopt any of them to benefit your specific arts advocacy efforts?